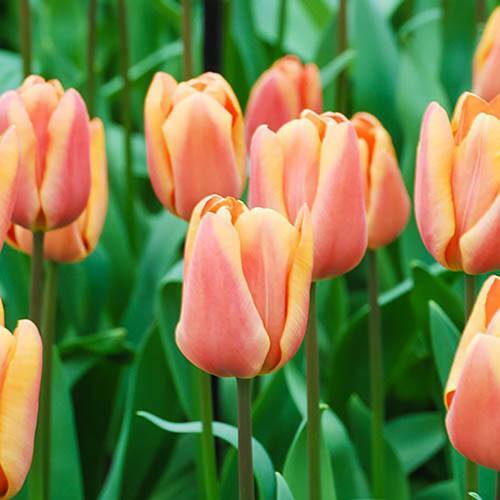 This beautiful apricot coloured tulip is incredibly versatile, very strong and sturdy and embraces the classic tulip shape. Tulips are one of the most popular spring bulbs as they are so easy to plant and grow and are perfect for planting in a mix of many different colour variations, giving your garden, patio or decking a fresh and vibrant spring makeover. Tulips also make great cut flowers to brighten up the house. Cut them long stems from the garden and bring them indoors and display in vases and containers on windowsills or on the mantlepiece - whatever space needs cheering up.